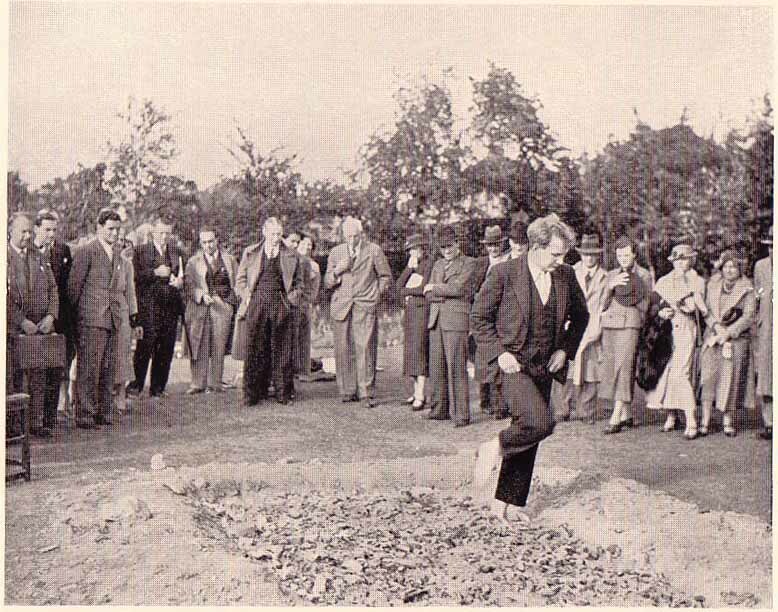 Harry Price devoted the final chapter of his Confessions of a Ghost-Hunter (Putnam, 1936) to the two experimental fire-walks which were carried out by Kuda Bux in Carshalton, Surrey in September 1935. The following is the complete text and plates of Chapter XXII. ﻿One of the ambitions of my life was to witness the fire-walk as performed by native devotees. I have been in several countries where the ritual is occasionally practised, but always missed it - sometimes by a few hours only. The fire-walk is a ceremony or rite - often of a religious character - which has been performed in various parts of the world for hundreds, perhaps thousands, of years. The details of the ritual vary in different countries, but one feature of it is always the same - the walking of devotees or ecstatics barefoot over hot stones or smouldering embers, placed usually in a trench, short or long, broad or narrow, according to the district where the spectacle is staged. It is done in India by priests, fakirs and other ascetics; it is performed in Bulgaria, (1) China, Tahiti, Japan, Fiji Islands, New Zealand, South Africa, Trinidad, Mauritius and Honolulu. But it was never seen in Great Britain until I staged two experimental fire-walks for the University of London Council for Psychical Investigation on September 9 and 17, 1935, respectively. Kuda Bux, the Kashmiri Indian ('the man with the X-ray eyes') was the performer, and the feat created the greatest interest among scientists and the official observers of our University Council. Kuda Bux has done the fire-walk in India on several occasions, and is thus acquainted with the technique of the ceremony. 1. See Bulgarische Festbräuche, by M. D. Amaoudoff, Leipzig, 1917, pp. 82 ff., for account of the fire-walkers (Nastinarki) of Vurgari, Bulgaria. performers prepare their feet? Can they convey their alleged immunity from burns to other persons? Do the 'walkers' burn their feet? Do they prepare their feet with a paste made of alum, salt, soap, and soda, as has been alleged? Does one have to be in an ecstatic or exalted condition? Does one have to possess 'faith'? 'Do the wood ashes (in the ember walk) form an insulating layer on top of the fire and thus prevent burning? Does the performer use an anæsthetic on his feet? Is the callosity of the skin the secret of the immunity from burns? Does the fakir have to hurry along the trench, or can he stroll? Does the devotee have to fast or otherwise prepare himself - mentally or physically - for the ordeal? These and similar questions we hoped to elucidate at our tests - and we found answers to most of them. The fire-walk has always been a supreme mystery and of perennial interest to newspaper readers. Judging from the correspondence which The Times printed in 1934, (1) the interest in fire-walking is greater than ever. Some readers believed that natives who walk about without any foot covering acquire a toughening of the soles of the feet which explains the immunity from injury in fire-walking; others did not. We have proved that the skin does not have to be callous. Before I describe the two rather exciting and intensely interesting fire-walks which I staged, I will give three typical examples of fire-walking in other places, viz. Umbilo, Durban and Singapore. It is very necessary that the reader should know something of fire-walking, in order that he may contrast the cold-blooded performances of Kuda Bux with the frenzied exhibitions witnessed in the Orient and elsewhere. The accounts have been selected from my large collection of works on exotic rites. 1. See The Times, London, for period between Feb. 14 and Mar. 3, 1934. 'Thousands of people thronged th+`e vicinity of the Umbilo Hindu temple yesterday afternoon to witness the strange religious ceremony, Theemeethe (or Treemiri), or fire-walking. Europeans jostled Indians in their endeavour to see the proceedings, which were even more weird than the ceremony which took place last month. 'A representative of the Natal Advertiser attended at the special invitation of the Hindu priest, and after witnessing the fire-walking, examined the soutris carefully. Six tons of firewood were used in making the fire over which the worshippers walked, but they suffered no harm to their feet, although the embers were white hot. 'Two medical men, Dr. Goldberg and Dr. Witkin, also examined the soutris, and the former said he could offer no physiological explanation of the normal condition of the Indians after their terrible ordeal. 'The ceremony began in the morning when the temple was made ready for the fire-walking. The tons of firewood were piled in their fire pit, which measured some 14 feet by 10 feet. About 11 o'clock the fire was lit and burnt so fiercely that no one could approach within yards of it. 'In the meantime the Hindus who were to undergo the ordeal had adjourned to the banks of the Umhlatazana River, where they prepared themselves with prayer and oblations for this supreme test of the Brahmanic faith. As in the case of the Thai Poosam ceremony, their mouths were bound to induce concentration of thought, and they took no notice of the chatting throng which milled continually round them. 1. For Mar. 5, 1928.
sions and was regarded with reverence by the devotees of her religion. 'As the morning wore on the crowd swarming about the grounds of the temple became denser, and a ring 10 rows deep formed round the fire pit, which had been roped off. 'Indian women in their brightly-coloured sauris continually made gifts to the effigies of the three Brahmanic divinities, Brahma, Vishnu and Siva, and gradually the throng became worked up to a high pitch of religious fervour. At two o'clock Major Webb Richards (Commandant of Police in the Durban district) arrived. He was garlanded by the priest with marigolds and chrysanthemums and formally welcomed. 'In reply, Major Richards stated his pleasure at being present. On the eve of his departure on transfer from Durban, he thanked the Indian community for being so well-behaved during his term of office here. 'The three medical men, Dr. Smith, Dr. H. R. Goldberg and Dr. M. Witkin, who were present by invitation, were also garlanded. Hundreds of Europeans were present by this time, and in many cases they incurred the wrath of the Indians by pushing their way through the throng and entering the enclosure. 'The representative of the Natal Advertiser and the photographer were asked to remove their shoes in the enclosure, and this they did. The close atmosphere became almost unbearable, for the fire had by this time become a heap of glowing embers, fanned occasionally by a slight breeze which filled the air with ashes. The sun blazed down directly on the close-packed throng, and to heighten the discomforture of the Europeans, tom-toms thundered close by without cessation. end of the fire for the fire-walkers to cool their feet after crossing the pit. 'The soutris arrived and walked round the pit. They were mostly in a state bordering on collapse, and all but the woman were skewered over their backs and arms with silver hooks, to which weights were attached. Several of them were supported by friends who walked beside them. 'Having circled the pit the soutris passed across the fire, their feet sinking in sickening fashion into the white charcoal. One by one they walked across, their faces showing no sign of pain, but their eyes were glassy as though they were in an hypnotic trance. 'One or two of them circled the pit again and crossed the fire a second time. Finally they were taken to the verandah of the temple, where the pins and hooks were remoyed from their flesh. Here Dr. Goldberg and Dr. Witkin examined their feet and found them free from blisters or marks. The medical men were unable to offer any explanation of the phenomena. 'The skin of the soutris which had been punctured in a thousand places did not bleed even when the hooks were withdrawn, and after a few minutes even the slight scars disappeared. 1. See The National Geographic Magazine, Washington, D.C., for April 1931. Vol. LIX, NO.4, p. 452 (one illustration). 'But the most curious of Durban's sights is that of the Indian fire-walking. Imagine a roped-off space where men rake level the embers of a great log fire. Half-suffocated masses of vividly draped East Indians, keyed to religious tension. Jostling throngs of unreverential Europeans in circus mood. Standards hung with palm fronds, and a little shoulder-borne shrine with idols of Brahma, Vishnu, and Siva. And presently the foliage of near-by trees scorches and dies, while attendants dash water in the faces of fainting women and children. 'What are these entering ten, lunatics or epileptics? They are naked to the waist; they are skewered through the flesh as meats are skewered; their heads loll, their tongues slaver, their eyes protrude. These, the soutris, or fire-walkers, have fasted week-long and have just been sprinkled with water from holy Ganges. 'Tom-toms beat, cymbals clash. The gaudy shrine has been set at the farther end of the fire bed, whose gray ash glows furnace-like under the least wind puff. And now – you gasp -", one of the soutris runs staggeringly across the fire to the altar of his gods. 'Another passes over, a woman, chanting; and now a third, a boy of eight years. Then come two who, colliding midway, fall prone on the fire bed, then arise and stagger onward to the shrine. And now all have passed over, and tom-toms and cymbals vibrate anew through the awed hush of India's massed ranks. 'The devotees, including quite a number of women, approximated 400. Some were kneeling and touching the earth with their foreheads, while others, more devout, were literally groveling in the dirt. A few were endeavouring to crawl or roll completely around the temple, a task which would have been difficult if the path had been clear and covered with velvety moss instead of being rough, crowded, and thick with dust. One elderly man seemed at the end of his strength when he had completed his self-appointed penance, although two friends had accompanied him and lifted him over drains and other hindrances. 'Many of those who had made a vow to undergo torture had prepared their bodies the preceding month by some form of penance, and had refrained from eating for a day before the event. 'While these zealots were proceeding with their tasks, a bed of coals was being prepared. Great piles of wood were burned to embers; then the ashes were raked into a neat bed about 24 feet long. It seemed hours to us before it reached this stage, as the atmosphere was rendered almost unbearable by the intense heat. 'At the end of the mass of live coals was dug a pool which was filled with milk brought to the spot in earthenware jars. The images of the gods were then brought from the temple and placed near this pool of milk. 'When all seemed in readiness, we heard the sound of drums and a stir of excitement swept over the crowds. This we were told signified the return of devotees from the Serangoon Road Temple, whither they had gone to complete final preparations. 1. 'The Fire-Walking Hindus of Singapore', by L. Elizabeth Lewis, in The National Geographic Magazine, Washington, D.C., Vol. LIX, No.4, April 1931, pp. 513-22 (12 illustrations). The next instant two men appeared with a goat, one holding the frightened creature's head and the other a hind leg. Another man raised a scythelike knife and in an instant the head was severed from the body. 'A fourth participant snatched the quivering, bleeding body and ran around the bed of coals, then disappeared in the throng. 'By this time I was feeling desperately ill, but with no possible chance for escape, for the crowds were now in a frenzied state, and it would have been unsafe to leave our refuge. The staring eyes of the devotees seemed glued upon the idols at the other end of the path of glowing embers. 'Finally, the priests who held back the devotees began to lash them with whips, and one by one they made a dash, barefooted, across the red-hot coals into the pool of milk. 'Each participant wore a short covering of cheesecloth stained yellow by saffron water, and each carried in his hands, clenched above his head, a twig of green from a tree supposed to possess curative properties. The wrists were tied together with yellow amulets. If the person was pure, the amulet would remain unbroken. I did not see any break. 'The priests would sometimes strike a devotee several times, and then give the wrists a stinging blow before releasing him. Not one flinched, nor did any appear to have felt the cut of the whip. Some ran and some walked slowly through the coals. 'The women seemed much calmer than the men. Some of them carried babies in their arms. One woman with a child fell when she had covered almost half the distance. The child was snatched from the embers, but the mother was rolled over several times before she was removed from the hot bed. Whether or not she was burned I could not tell, but she seemed on the point of exhaustion. Draupadi, the deity invoked at this festival. These five kings had some cousins who envied their position. Duryodhana, their leader, conceived a plan whereby he could obtain the coveted kingdom. He invited the Pandus to a gambling party at his palace and through trickery won their kingdom. 'Duryodhana then sent for the queen and endeavoured to disrobe her in public. A higher power protected her chastity by making her garments unending. Through sheer exhaustion, Duryodhana finally gave up his attempt to disrobe Draupadi, who then untied his turban and vowed that she would not retwine it until her enemies had been destroyed, and then she would bathe in fire as a proof of her chastity. 'A war followed, and when the Pandus were the victors Draupadi performed her vow. So to-day she is worshipped as one of the seven goddesses of chastity, and even the mention of her name is enough to "wipe away all sins". As fire-walking comes well within the domain of psychical research, the University of London Council for Psychical Investigation decided they would make an attempt to elucidate the mystery, and to that end I inserted an advertisement in the personal column of The Times (1) inviting amateur and professional fire-resisters to come forward and perform the feat. We had hundreds of letters from those who had seen the fire-walk, and from those who wanted to see it, but not a single reply from anyone who was prepared to do it. cutting book to prove that his statement was correct. He was then about to leave for the Continent, but he agreed to remain in London a few weeks longer in order that I could stage an experimental fire-walk, under scientific conditions. The next question was how to test Kuda Bux. Of course, it was difficult to determine his mental state at the time of 'walking', but certain physical tests could be applied. A number of scientists were appealed to, but it was generally agreed that no one in this country knew anything about fire-walking. We received several suggestions. Professor Frank L. Hopwood, D.Sc., the physicist at St. Bartholomew's Hospital Medical College (University of London), was very helpful. He suggested X-raying the man's feet. If they were 'doctored' by impregnation with any metallic salt or element heavier than sodium, the skiagram would show it. But it would not reveal organic compounds unless they contained iodine or the like. Another proposal was that we should take the temperature of the soles of the feet immediately before and after the trial. A third suggestion was that a cold mirror should be held near the soles of the feet to see whether any semi-volatile liquid covered them, thus producing the 'spheroidal state' which might act as a heat insulating layer. Another physicist said the 'cotton test' might prove valuable. It is well known that flesh scorches at a lower temperature than cotton; consequently, if the fire should burn the cotton, it ought to burn Kuda Bux's feet as well. Another obvious test was to measure the surface heat of the fiery trench by means of a thermocouple; and, if it was thought that the ash acted as an insulator between fire and feet, then the thermal conductivity of the ash must be ascertained. 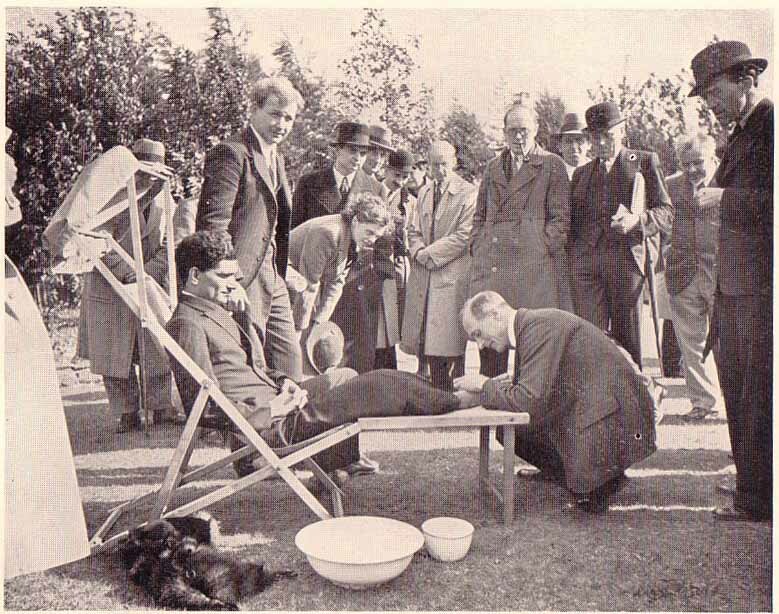 Kuda Bux's feet being medically examined by physician immediately before first trial at final fire-walk, September 17, 1935. 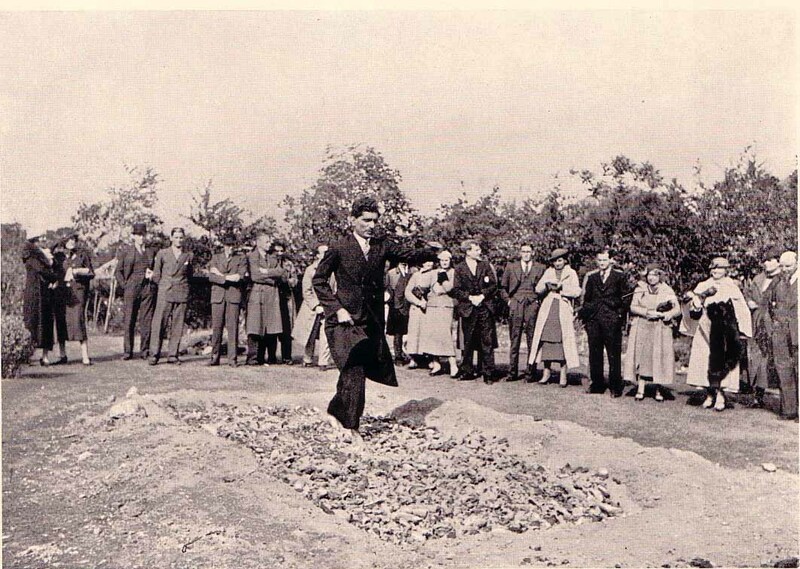 Mr. Digby Moynagh attempting the fire-walk at final test, September 17, 1935. Two tons of oak logs, one ton of firewood, half a load of oak charcoal, ten gallons of paraffin, twenty-five copies of The Times - and a box of matches. This was the incendiary material used in the first fire-walk ever seen in Great Britain. Kuda Bux ('Professor K. B. Duke'), the Kashmiri magician, walked barefooted over more than three tons of wood reduced to red-hot embers which had been burning and smouldering for several hours. The test attracted a distinguished company of scientists, and important data were secured concerning the technique of fire-walking. One thing I discovered was that staging a fire-walk takes a good deal of organising, much hard work, and many hours' preparation. Though the walk did not take place until nearly three o'clock in the afternoon, most of the day, and all the previous evening were spent on making things ready. The trench itself took one man six hours to dig. It was twenty-five feet long, three feet wide, and twelve inches deep. It was my original intention that our trench should be thirty yards long, ten feet wide, and twelve inches deep. Even to have half-filled this great trough with burning embers would have taken nearly fifty tons of wood! Fortunately, I consulted several works which gave accounts of fire-walks, both in India and elsewhere, and found that the trench we finally dug was about the average size. 1. See 'Walking Through Fire', by Harry Pricy, in The Listener, London, for Sept. 18, 1935, Vol. XIV, No. 349, pp. 470-3 (12 illustrations). the trench. Over the firewood were placed about three hundred oak logs built ridge fashion, with the apex of the ridge running parallel with the trench. A couple of tarpaulins were placed over the whole as a protection from possible rain. As no native of this country has had any experience in making fire trenches, we were in a quandary as to when to light the fire. How long would three tons of wood take to burn into red-hot embers? Kuda Bux himself was rather uncertain, as he had had no experience in burning seasoned oak logs. The wood they bum in India for ceremonial fire-walks is of a certain kind; it is very hard and slow-burning. However, I judged that between three and four hours were necessary to reduce the wood, so at eleven o'clock on the morning of the test the officials assembled to ignite the mass. We found that it was not at all an easy matter to light a huge bonfire buried in a trench. After two or three futile attempts with matches, we decided that we needed the paraffin which we had provided for such an emergency. By means of an enamel garage jug we soused the logs with paraffin, using one gallon for every two and a half feet. At 11.20 I ceremoniously applied a match at one end, and in five minutes the trench was a blazing inferno of flames and oily smoke which almost choked the bystanders. We had lighted the great fire. The flames soon died down; the smoke cleared away, and the merry crackling of the stratum of firewood told us that all was well. We piled on the remainder of the logs. Fortunately our combustible material was dry, and in thirty minutes the logs themselves were well alight, and it was impossible to stand closer to the trench than three feet. At 12.10, one could not approach within six feet of the fire without feeling uncomfortably hot. with a pure white ash, and were slowly burning through. At 12.45 Kuda Bux removed his shoes and socks in order to 'test the fire'. He planted one bare foot in the middle of the embers and stepped across the trench. He said it was all right, but that there was too much unburnt wood, and not enough fire. Immediately before Kuda Bux stepped into the trench, I threw on the fire a piece of writing paper: it took exactly three seconds to ignite. At 12.55 the Kashmiri again stepped into the trench with his bare foot and pronounced it 'fine'. He then said it was time to put on the top layer of forest-burnt charcoal, which we did. The charcoal was the purest we could find, and, to test its quality, Kuda Bux ate a piece and said it was 'good'. The fire was now a mass of red-hot glowing logs, and one could not stand near it for more than a few seconds at a time. We had a staff of helpers, raking and smoothing out the embers, and they had to use wooden shields to protect their faces from the intense heat. At one o'clock, a piece of white paper dropped into the trench burst into flames upon contact. I tried to take a close-up of the trench with my cinematograph camera, but found I could not get near enough, owing to the heat. As the fire was now becoming perfect for the test, we decided to leave it and have some lunch. If we discovered nothing else during our test, we learnt that fire-walkers eat. We all had a square meal, and although Kuda Bux's religion precluded his taking any animal food, he consumed a light lunch. There was no question of his having to fast in order to walk on red-hot embers: 'That is a fallacy', he said. could give no clear reason for this, but said it was much more difficult to walk on a thin layer of fire. It appears to be part of the technique of fire-walking, and is a very important point for future research. Curiously enough, unless the bottom of the trench is completely covered with live embers, Kuda Bux cannot walk on it: it just burns him, though an observer would imagine that the bare base of the trench was not nearly so hot as the glowing embers. In order to make the layer of fire thicker, we raked the embers from one end, piling them on to the centre of the trench, which was now shortened to about twenty feet. At 2.45, we were ready for the test. A number of scientists and others had arrived and the company included Mr. R. S. Lambert, the Editor of The Listener; Mr. Digby Moynagh, the Editor of St. Batholomew's Hospital Journal; two physicists; Dr. William Collier, an Oxford physician; Professor J. A. Gunn, the pharmacologist; Mr. and Mrs. Alex. L. Dribbell, and others. Kuda Bux said he was ready to demonstrate, and donned a long black cotton frock coat for the performance. I examined this (and his trousers) for concealed chemicals or other preparation. Before the test commenced, it was necessary that Kuda Bux should be medically examined. A most important part of this examination was the inspection of his feet. Dr. Collier took several ‘swabs', and pronounced his feet normal. The 'swabs' were subsequently handed to a pathologist, who reported that he could find nothing definite in the reactions, either inorganic or organic. In other words, the results were negative. I thought, that the soles of Kuda Bux's feet were particularly soft. Of course, he always wears shoes, so there is no question of the skin having become hardened through his walking barefoot for long periods. His right foot was washed, and it is quite certain that no preparation or chemical was used to render him immune from burns. His feet were photographed before and after the demonstration, and other scientific tests and photographs were made and valuable data acquired. Before Kuda Bux stepped into the trench, he carefully brushed away the ash from the embers. Sometimes he uses a fan for this purpose. Whatever else we discovered on this historic afternoon, we proved quite definitely that the ash plays no part in forming an insulating layer between the feet and the fire. Kuda Bux will not walk on ash: he prefers the red embers. Kuda Bux stepped into the trench four times with a maximum of four steps during the first 'walk'. He did not run, but walked steadily. Unfortunately, the fire was not quite to his liking, as it was too shallow. In places, the fire had burnt down to the ground, and this worried him. 'I must have thick fire to walk on', he reiterated. But he did his best, and it was our fault that we did not have a fire that he could wade through. After the last trial, I threw in several pieces of paper, and they burnt on contact with the embers. Also, the trench was so hot that one could not go near it in comfort. (Twenty-four hours later the embers were just cool enough to lay the hand upon.) After the fourth trial Kuda Bux decided that he would not 'walk' again, as the fire was not thick enough. After the final walk his feet were examined and photographed: they were not affected in any way, and there was not a suspicion of a blister. After Kuda Bux had demonstrated that fire-walking is a possibility, we applied the 'cotton test' to the fire. We procured a wooden shoe last (attached to a rod), and covered it with calico. Imitating a person walking, we placed the wooden 'foot' to the embers over which Kuda Bux had just walked. In one second the calico was scorched; in two and a half seconds the cotton fabric was burnt through in several places. There was no question of the fire not being hot! The temperature of the heat above the fire was also taken. men present that he should walk in the trench. After some consultation, they advised him not to. Kuda Bux also warned him against making the attempt. Mr. Moynagh asked me what he should do. Although naturally I was averse to his burning himself, as Mr. Moynagh was anxious to make the experiment, I consented. It was necessary in the interests of science that someone should do the identical walk at the same time as Kuda Bux, with the same fire and under identical conditions. I will take this opportunity of thanking Mr. Moynagh for his courageous and public-spirited action. Mr. Moynagh again removed his shoes and socks and, after a moment's hesitation, stepped boldly into the fire, and walked two paces before jumping out. He was in the trench about two seconds. He said that it was hot, and that his feet tingled. For some time he felt nothing further, but in thirty minutes blisters had formed on the soles of his feet and he had to receive attention at the hands of the trained nurse who was in readiness in case of accidents. He was somewhat badly burned, and felt the effects of his fire-walking adventure for some time afterwards. I examined the soles of his feet, and the epidermis seemed fairly thick and hard. I am sure that my own feet would have been still more badly burned. Mr. Moynagh's performance concluded the afternoon's programme (it was nearly five o'clock), except that Kuda Bux gave us a demonstration of his so-called 'eyeless sight' faculty, which impressed every person who witnessed it. I have already described his performance in the chapter 'The Man with the X-ray Eyes'. 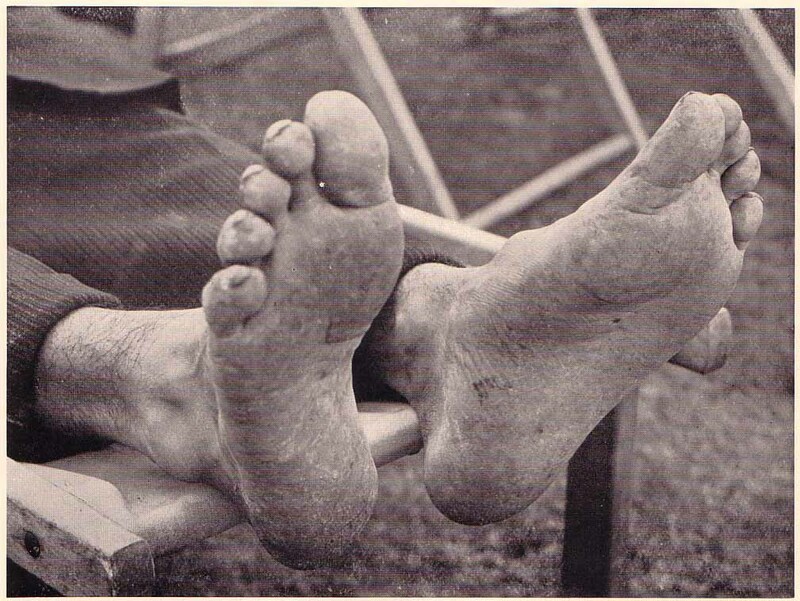 Kuda Bux's feet, quite uninjured, after fire-walk rehearsal, September 9, 1935.
between fire and feet. We proved that - in the case of Kuda Bux - fasting is not necessary, and that he does not have to work himself up into an exalted or ecstatic condition: he appeared so unconcerned that he might have been walking across the room. We could detect no trickery in the Kashmiri's performance, which appeared perfectly straightforward, and no preparation of the feet was thought possible, under the conditions. So we asked ourselves what was the secret of the fire-walk. Three alternatives were left to us: (a) that it is done by 'faith'; (b) that the callosity of the skin is responsible for the absence of burning or pain, during the momentary contact of the feet with the embers, though this cannot apply to Kuda Bux as his feet are soft; (c) that a knack in placing the feet is the cause of Kuda Bux's immunity from burns. Or perhaps, in the case of some fire-walkers, there is a way in arranging the fire in such a manner that - with courage - one can walk through the embers without being burnt. Kuda Bux was unhappy about the fire we prepared for him, and it must be admitted that he did not stay in the trench very long. But we are grateful to him for the demonstration, which will become historic. We decided that for the next test we would burn much more wood, and allow Kuda Bux to inspect the trench before being filled. We did not prove that Kuda Bux can transfer his immunity from burns to other persons. He claims to do this, and I hoped that at the next test he would demonstrate that it can be done. In the traditional Indian fire-walk, as the reader has seen, it is a common sight to see a troupe of devotees following their leader or priest through the trench: they emerge unscathed. of a certain quality, and this may have some bearing on Kuda Bux's ability to perform the 'walk'. He informed me that the only thing that will burn him is cow dung. One piece in a fire would, he said, make it impossible for him to do the walk. The reason is that it is 'unclean' to a fire-walker. As a matter of fact, it is alleged that any foreign matter in the fire upsets the performance. The second test was held on Tuesday, September 17, 1935, on the same site at Carshalton. It will be remembered that Kuda Bux was not happy concerning the lack of fire we provided for him at the first 'walk', although more than three tons of material were burnt; also, the trench was too narrow (three feet). At our second test we burnt seven tons of oak logs, one ton of firewood, half a ton of oak charcoal, ten gallons of paraffin, and fifty newspapers. The trench was widened to six feet, and the depth reduced to nine inches. On the afternoon previous to the test, Kuda Bux inspected the trench and stated that he wanted a 'platform' of earth in the centre; This he constructed himself, and divided the trench into two portions or pits, with a mound of earth thirty-six inches wide dividing them in the centre. The length (twenty-five feet) was not altered. So now we had what were really two trenches, placed end to end, each being eleven feet long, six feet wide, and nine inches deep. I think the real reason for this division in the trench was because Kuda Bux wanted to shorten it; and jumping on to a platform at one end of a short pit was more dignified than stepping off half-way across a long one. it through the piles of logs and packing-cases. By 8.45 both trenches were well alight. We spent the morning in feeding the fires with the remaining three and a half tons of logs, and by one o'clock the trenches were a mass of red embers, radiating a terrific heat. The wind shifted every few seconds, and with each gust showers of sparks and ash nearly smothered the helpers, who were blinded by the heat-laden wind which made stoking almost impossible. The wearing of goggles relieved us somewhat, but I had a raincoat scorched through merely throwing on a log. The heat could be distinctly felt at a distance of sixty-five feet, on the leeward side of the trenches. After lunch the red embers just filled the trenches flush with the ground. It was still blowing half a gale, and as the wind swept across the fires they were fanned almost to white-heat. It reminded me of a mighty blacksmith's forge at full blast. With each gust all the ash was blown from the surface of the fires. Dr. R. E. Gibbs, Dr. A. S. Russell, Dr. E. H. Hunt, Dr. T. E. Banks, etc. Having put on the top dressing of charcoal, the surface of the fires was transformed from a rich cherry colour to a dull black, and we waited patiently for the lumps of charcoal to redden. This took less than half an hour owing to the high wind increasing the surface combustion. By three o'clock the charcoal was red hot. At 3.14 Kuda Bux made the first walk, doing four strides (each foot on the embers twice). From the moment the first foot was removed from the bank until the last foot left the trench was 4.5 seconds, official timing. Kuda Bux walked steadily, and jumped on, to the platform between the two fires. He returned to the base where, within ten seconds, Professor Pannett again took the temperature of the soles of his feet: it was now 93° Fahrenheit -which, of course, was actually lower than before the walk. The piece of plaster was quite untouched, except that some loose fluff at the cut edges looked very slightly scorched. The man's feet were neither blistered nor injured. ﻿1. For Professor Pannett's full report, see Nature, Vol. 136, No. 3438, Sept. 21, 1935. Also The Lancet for Sept. 28, 1935; and 'Fire-Walking Experiments', by Harry Price, in The British Medical Journal for Sept. 28, 1935. Kuda Bux walking on red-hot charcoal at first trial during final test, September 17, 1935. At 3.17 Kuda Bux once more stepped on to the same pit, and again did four strides (each foot on the embers twice), taking 4.3 seconds. He would not walk across the second (farther) pit as he said there was 'something wrong with it'. Of course, this disinclination to walk the second pit was psychological, as both pits were identical in every way. His feet were again examined and found to be uninjured. Forty-eight minutes later Professor Pannett again examined his feet, and no injury was apparent. After the second walk, the physicists took the temperatures of both the surface and the main body of the fire. The temperature-measuring device was an electric thermometer consisting of a thermal junction connected to a temperature indicator. The junction consisted of a thin disc of copper, to which wires of copper and eureka were fastened. The wires were passed through holes in a piece of uralite and pulled, in order to bring the disc into contact with the uralite, so that when the disc was pressed on the fire the conditions were favourable for the absorption of heat and its retention when the junction was raised for another impact. It was found that the main body of the fire was 1400° Centigrade (2552° Fahrenheit), which is exactly the temperature of white heat (steel melts at 1371° Centigrade). The surface of the fire was 430° Centigrade (806° Fahrenheit), the temperature between that at which coal ignites and dull red heat. The thermal data were supplied to me by Dr. R. E. Gibbs. Kuda Bux then prepared to walk the trench a third time; he stood on the edge, then asked for five minutes' grace, and finally came to me and said he could not do it again. The instruments and the tests had unnerved him. 'Something inside me has broken', he told me. 'You are not angry with me, are you?' I tried to comfort him by saying that he had put up an excellent show, and had done his best. 'I have lost my faith, and if I do it again, I shall burn myself,' he said. Moynagh (who, it will be remembered, entered the trench at the previous experiment on September 9, 1935) said he would again attempt the walk. He removed his shoes and socks, walked into the pit, and did two steps (i.e. each foot on the embers once: 2.2 seconds). As his feet were covered with healing blisters which he acquired on his last fire-walk, it was difficult to tell what fresh blisters he had acquired, but he could not walk the length of the trench. It was noticed that his feet were moister than those of Kuda Bux. It was exceedingly plucky of him to try the experiment a second time. After Mr. Moynagh's performance, Mr. Maurice Cheepen stepped into the trench and gave two quick, short steps (i.e. each foot on the embers once: 2.1 seconds) before reaching the bank. Actually, he crossed the corner of the trench. His feet were badly blistered, and I saw bleeding at three points. These wounds might have been caused by the burnt skin rubbing off the soles of his feet as he hurried out of the trench. It was a plucky attempt. We had a trained nurse available in case of accidents, so the 'wounded' received every assistance. As there were no other volunteers forthcoming, we adjourned for the tea interval. After tea Kuda Bux gave another 'eyeless sight' demonstration which was very successful. 1. See The Times, London, Sept. 18, 1935 (No. 47,172), for an account of the second experiment (3 illustrations). ability to 'walk' over such an intensely hot trench. His sudden breakdown after the second walk seems to indicate that, after all, 'faith' (or confidence) plays some part in the performance. I think that may be the secret of the fire-walk. After that faith had 'broken' within him, nothing would induce him to do the walk. He was not in a fit mental condition. We proved that the immunity from burns is not due to the callosity of the skin, as Kuda Bux has soft skin, which is not callous. We exploded the theory that ash acts as an insulator between feet and fire, as the wind and our rakes removed it all. We have proved that it is a fallacy that ‘anyone can do it'. There was no proof that the feet were prepared in any way, and we were successful in providing an even hotter fire than is usual in India - thanks partly to the high wind. Speaking of the intense heat, at ten o'clock on the evening of the test the trenches looked like two huge cauldrons of red-hot molten metal, reminiscent of what I have seen at smelting works. Although the night was quite dark, one could easily read a copy of a newspaper by the glow of the red-hot embers. By noon next day the fire was still too hot for one to place one's hand upon. 1. ln a leading article, 'A Strange Ordeal', Sunday, Sept. 22, 1935 (No. 7530). monest assumptions is of the greatest rarity.' But we received no evidence that the 'walk' was accomplished by occult means. Professor Sir Leonard Hill, F.R.S., the physiologist, made an interesting suggestion as to how Kuda Bux may have performed his feat. He says (1): 'There is no 'evidence that the fire-walking feat of Kuda Bux had to do with faith, other than the fact that confidence prevented sweating, and kept the soles of the walker's feet dry. It is known that sweating takes place from the palms and soles when a person is alarmed, the object of the sweat being to secure a good grip. The professional firewalker had dry feet; the feet of the amateurs, on the other hand, were moist, and, in consequence, charcoal stuck to one of them.... ' It is possible that Sir Leonard's explanation may be the correct one, though Lt.-Col. H. Lee demolished his arguments in a letter to The Listener (October 23, 1935). In addition to the part that faith and nerve control may have played in Kuda Bux's fire-walking, I think there is a certain technique to be learnt. He said he first practised fire-walking in India when he was fourteen years old (he is now thirty), so he must have acquired considerable knowledge concerning the best way of performing the ceremony. There was not the slightest suggestion of trickery, but I imagine (I may be wrong) that the feet are placed on the embers in a certain way, though the slow-motion cinematograph film which I took reveals nothing but ordinary walking. Kuda Bux is of the physically slight Indian type, is not very heavy (he weighed one hundred and twenty pounds), and that may be in his favour. But Mr. Cheepen was fairly heavy (one hundred and sixty-three pounds), and his feet were badly burnt. Mr. Moynagh was still heavier (one hundred and sixty-eight pounds), and, I should imagine, weight is a decided disadvantage in a fire-walker. 1. In a letter to The Listener, Oct. 16, 1935. These lines are taken from Arruns's prayer to Apollo for permission to wipe out the disgrace that has been inflicted on the Trojans in Italy by Camilla, the Queen of the Volsci. Freti pietate suggests that, even among the ancients, fire-walking was considered a trial of faith; cultores denotes that it was practised under the cult of Apollo. 2. For the official record, see: 'A Report on Two Experimental Fire-Walks', by Harry Price, Bulletin II of the University of London Council for Psychical Investigation, London, 1936 (20 illustrations and a Bibliography).